It was the beginning of a new era in independent ethical publishing. Now with the March edition of the New Internationalist magazine, we celebrate 40 years of the magazine that was launched with so much optimism for a better world. The great news is that Peter Adamson is back in the 40th anniversary magazine. He is uniquely placed to review the progress that has been made in these past four decades. His lead story in the magazine is a must-read, as he analyses and assesses the advances in global health and welfare. Importantly he also looks forward and makes a prediction of what will be the great challenge of the next 40 years. I highly recommend the magazine. Like most print publishers, we launched a digital offering a few years ago, but we needed something that better reflected our independent fresh view of the world, so we built our next generation app in-house. The launch coinciding with the 40th anniversary of the magazine is perfect. Responsive design – automatically adjusts to the device being used – so it’s easy to read on anything from a wide-screen desktop to a mobile phone. One-click guest pass so you can share a subscriber-only story with friends who aren’t yet subscribers. Access to a growing archive of previous issues of the New Internationalist magazine. An ongoing subscription automatically renewed. 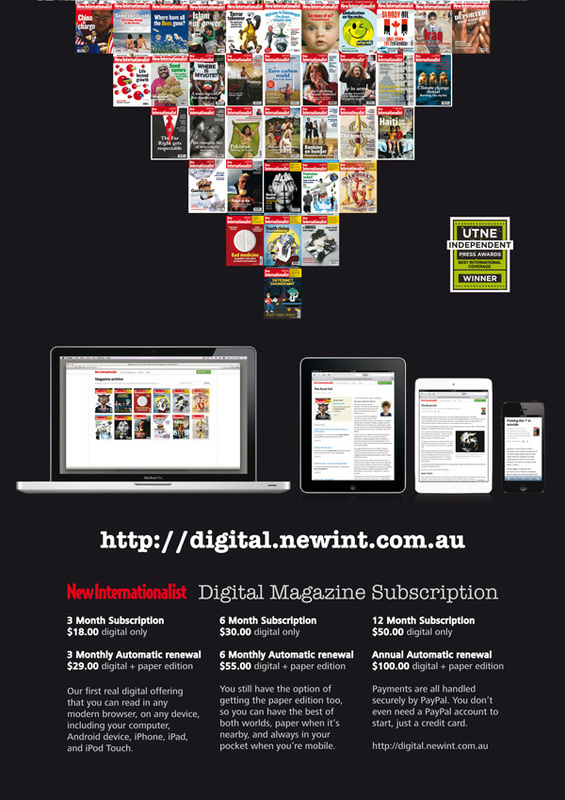 A combined bundle – digital + print subscription. When you stop to think about it, the New Internationalist is a remarkable media organization. Who would have predicted that a magazine on human rights and global equity would survive four decades of subscriber-supported independent journalism? Who would have thought a magazine – managed as a co-operative, and with a flat salary structure – would be a beacon of global justice for 40 years, shining a light onto the hidden agendas of politicians and corporations alike? And who would have thought that a small not-for-profit co-operative could produce – in-house – a leading-edge next-generation digital magazine subscription service? It makes me so glad I met Peter Adamson all those years ago. This entry was posted in Activism, Education, Foreign aid and development and tagged activism, equality, independent media, New Internationalist magazine, Peter Adamson, politics by Brian Loffler. Bookmark the permalink.